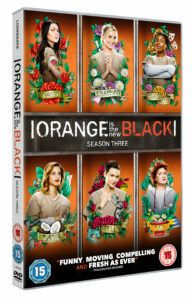 The third coming has arrived for the women of Litchfield Penitentiary in the critically acclaimed and revolutionary series ORANGE IS THE NEW BLACK, with Season Three released on DVD, Blu-ray and Digital HD on 16th May. Based on a true story, ORANGE IS THE NEW BLACK is a heartbreaking, yet hilarious series set in a women’s prison and features powerful performances by an award-winning ensemble cast including Taylor Schilling (2014 Primetime Emmy® Nominee, Outstanding Lead Actress in a Comedy Series and nominated for 2014 and 2015 Golden Globe® Awards, Best Actress in a Television Series (Drama, Musical or Comedy), “Orange Is the New Black”), Uzo Aduba (2014 Primetime Emmy® Winner, Outstanding Guest Actress in a Comedy Series, and 2015 Primetime Emmy® Winner, Outstanding Guest Actress in a Drama Series and Nominated for 2015 and 2016 Golden Globes®, Best Supporting Actress – Series, Miniseries or Television Film, “Orange Is the New Black”), Laura Prepon (That 70s Show) and Kate Mulgrew (Star Trek: Voyager). With all our Litchfield favourites back behind bars – including Laverne Cox (2014 Primetime Emmy® Nominee, Outstanding Guest Actress in a Comedy Series, “Orange Is the New Black”), Natasha Lyonne (2014 Primetime Emmy® Nominee, Outstanding Guest Actress in a Comedy Series, “Orange Is the New Black”), Taryn Manning (TV’s “Sons of Anarchy”), Samira Wiley (The Sitter), and introducing Ruby Rose (Around the Block) – Season Three of ORANGE IS THE NEW BLACK is as fresh and juicy as ever! For a chance to win 1 of 3 awesome Orange Is The Black DVD boxsets just enter via our competition app below! The competition ends at 23:59 on 25 May 2016. The prize consists of an Orange Is The New Black Season 3 DVD boxset.